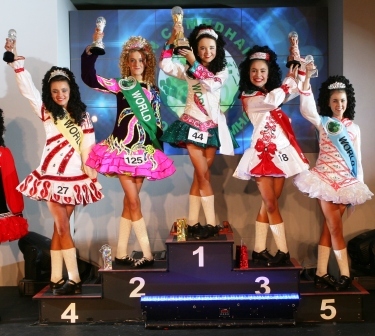 The first An Comhdháil World Irish Dance Championships were held at CityWest Hotel in Dublin, Ireland from April 1-7, 2012. Though the organization is more than 40 years old, past majors have only been at the All-Ireland or All-Scotland level. Dancers and teachers were welcomed to the week-long celebration of the An Comhdhail's best Irish dancers at CityWest in Dublin. An Comhdháil Na Múinteoirí Le Rincí Gaelacha is an association which, since 1970, has certified Irish dancing teachers and adjudicators whose mission is to "foster, encourage and promote at a local level the art and practice of Irish dancing". While the website says there are a total of 24 regions located in Australia, Eastern Europe, Ireland, the United Kingdom and the United States of America, most An Comhdháil competitors - and all of the 2012 An Comhdháil World Irish Dancing Champions - are from Ireland or Scotland. Little champion shares "An Irish Dancer's Oath"
An Comhdháil World Irish Dance Championships consisted of 20 solo championships: 13 girls' competitions from under 10 to Senior Ladies over 21, and 7 boy's championships which are double age groups starting with under 11 upwards. All Championships are over three rounds, with five adjudicators. The first two rounds are also adjudicated as a solo by a sixth adjudicator. The solo results given have no impact on the overall Championship result. Full results, including solo round awards, may be found at An Comhdháil World Irish Dance. Look for photo galleries here on Irish Central's Irish dance page in the next few days courtesy of ReelDancePix. Check back here for news, results, photos, interviews and more! Help us celebrate Irish dancing by sharing this story with your friends, like Feis America Magazine on FaceBook, Tweet the link or start a conversation with a comment in the message box below. THANK YOU!